(1978) "Blame It on the Boogie"
(1978) "Shake Your Body (Down to the Ground)"
"Blame It on the Boogie" is a song originally released in 1978 by English singer-songwriter Mick Jackson, then The Jacksons, and later covered by numerous artists. The song was performed on Musikladen (January, 1979), Aplauso (February, 1979), Sonja Goed Nieuw's Show (2nd February, 1979) and ABBA Special: Disco in the Snow Part 1. The song was co-authored by Mick Jackson (credited as Michael George Jackson-Clarke) as well as Mick's brother, David Jackson and Elmar Krohn. Although Mick Jackson recorded the song in 1977, "Blame It on the Boogie" was written in hopes of being sold to Stevie Wonder. The Mick Jackson track was showcased in 1978 at Midem where according to Mick Jackson: "The Jacksons' manager [Peter Kerstin] heard the track being played...and took a tape recording of it...back to the States [where] The Jacksons quickly recorded a version so it would be out before mine." In fact, the Mick Jackson recording was released by Atlantic Records in the US in August 1978. According to Michael Jackson of the Jacksons, Bobby Colomby, who was producing the Jacksons' Destiny album, brought the group "Blame It on the Boogie". "It was an uptempo, finger-poppin'-time type song that was a good vehicle for the band approach we wanted to cultivate. I had fun slurring the chorus: [the lyric] 'Blame It on the Boogie' could be sung in one breath without putting my lips together." Despite the Mick Jackson original reaching a #61 peak on the Billboard Hot 100 in September 1978, Epic Records that month released the Jacksons' version of "Blame It on the Boogie" as the advance single from the Destiny album. Although "Blame It on the Boogie" returned the Jacksons to the Hot 100 after five flop singles it was not the single to effect a major comeback for the Jacksons, peaking at #54; it would be the follow-up, "Shake Your Body (Down to the Ground)", which would briefly restore the Jacksons' Top Ten fortunes. However, "Blame It on the Boogie" did reach #3 R&B and would be coupled with "Shake Your Body (Down to the Ground)" on an extended club play single which would reach #20 on the dance charts in 1979. In the UK both the Mick Jackson version and the Jacksons' were released within a few days of each other in September 1978. The UK music press, struck by the rival versions being by similarly named artists, declared a "Battle of the Boogie" which Mick Jackson recalls as "great publicity...There was an equal balance of interest from the media about both releases - A good example is that my version came out first on Top Of The Pops... The Jackson's [sic] had the second week...Radio One played The Jackson's [sic] version and Capital Radio only played mine - It was fair." The Jacksons' version—incorrectly lauded by Melody Maker as their "self-penned song"—was the more successful version reaching Number 8 on the chart dated 4 November 1978; the Mick Jackson version—hailed by NME as "far superior"—had peaked at Number 15 on the chart for 21 October. Mick Jackson himself in 2003 said of the Jacksons' version of "Blame It on the Boogie": "[the original] version had 100% of our heart and soul in it but the Jacksons' version had the magic extra 2% that made it incredible." A promotional music video by the Jacksons was created for "Blame It on the Boogie" in 1978. The video, featuring the group's members dancing on a black background, relied heavily on electronic trail effects, created at Image West, Ltd. using then-cutting edge equipment: the Scanimate analog computer system and a Quantel DFS 3000 digital framestore. The video also appears on the bonus disc of the DVD box set Michael Jackson's Vision. Michael Jackson's 1993 biography states that the video marked his video debut. The Jacksons' very first promotional music video was "Enjoy Yourself"
(1989) "Blame It on the Boogie"
(1989) "Can't Shake the Feeling"
Tina Charles has stated that she recorded "Blame It on the Boogie" prior to the Jacksons; her version was not released as "Sony [felt] it was not a strong enough song." 1989: Stock Aitken Waterman had Big Fun remake "Blame It on the Boogie" with a resultant best ever Pop chart peak of Number 4 UK. 1990: Luis Miguel recorded the song in a Spanish-language version entitled "Será Que No Me Amas" on his album 20 Años and by Chris Watrin, and is a concert favorite. The song received radio airplay in Mexico. 1998: Dance act Clock brought "Blame It on the Boogie" back to the UK Top 20 (Number 16). 2001: Will Young sang "Blame It on the Boogie" for his first audition of Pop Idol on ITV in 2001. 2003: "Blame It on the Boogie" was the lead single off the Michael Jackson tribute album Bringin You the Magic recorded by Jay Kid a native of Denmark (born Yannick Harrison 8 January 1990) who in September 2003 became the first artist to perform at the Neverland Ranch at Michael Jackson's express invitation. 2004: German eurodance act Captain Jack covered the song on their album Café Cubar. 2005: the top ten finalists of the French televised Nouvelle Star cut a remake, which reached Number 15 in France. 2008: The song was performed by Westlife on their Back Home Tour. 2009: In the wake of the interest in Michael Jackson's recordings initiated after his death on 25 June "Blame It on the Boogie" entered the charts in Australia and the UK. 2009: The song was performed by The Saturdays in one venue of their The Work Tour, due to Michael Jackson's death. 2010: The song was performed by children at the Albert Hall in a Michael Jackson medley. 2011: The song was performed by Jermaine Jackson, brother of The Jacksons. The music video for the version was completed late 2011 and was released January 2012 on international music video websites. In 2010, filmmaker Patrick Nation made a Channel 4 documentary about Mick Jackson and the story of the song, entitled The Other Michael Jackson: Battle of the Boogie. The documentary was co-written and presented by Mick's son Sam Peter Jackson and led to Mick Jackson's 1978 album Weekend (which features the original version of "Blame It on the Boogie") being re-released (for download on the iTunes Store) for the first time in 30 years by Demon Music. To promote the documentary, Mick gave a rare television interview to BBC Breakfast. ↑ Levine, Nick (July 7, 2009). "Michael Jackson's Top 20 Singles: Part One". Digital Spy. Retrieved May 15, 2016. ↑ "Mick Jackson Official Website". Mickjacksonmusic.com. Retrieved 2010-06-13. ↑ ""Blame it on the Boogie" - Record sleeve". Atlantic Records. ↑ "Introduction". Mick Jackson Music. ↑ "Michael 'Mick' Jackson". disco-disco.com. ↑ Jackson, Michael (2009). Moonwalk (Revised ed.). New York NY: Harmony Books. p. 154. ISBN 978-0-307-71698-9. ↑ Whitburn, Joel (2004). Top R&B/Hip-Hop Singles: 1942-2004. Record Research. p. 287. ↑ Whitburn, Joel (2004). Hot Dance/Disco: 1974-2003. Record Research. p. 132. 1 2 "Michael 'Mick' Jackson". disco-disco.com. ↑ "Blame it on the Boogie". ChartStats.com. ↑ ""Blame it on the Boogie" by The Jacksons". SongFacts. ↑ "Image West Scanimate Demo 15B". Retrieved 2010-04-01. ↑ "Dave Sieg's comments". Retrieved 2010-04-01. While I worked at Image West, we did a number of effects using a Quantel 3000 framestore to create "trails", including this Michael Jackson video, "Blame it on the Boogie". This is from my archives of work from that era. ↑ Campbell, Lisa D. (1993). Michael Jackson: the king of pop. Boston MA: Branden Publishing. p. 364. ISBN 0-8283-1957-X. ↑ "Blame it on the boogie in Canadian Top Singles Chart". Library and Archives Canada. Retrieved 8 July 2013. ↑ "Mick Jackson awards on Allmusic". Allmusic. Retrieved 8 July 2013. ↑ Chris Cadman, Craig Halstead (2002). Authors Online Ltd, ed. Michael Jackson the Early Years. p. 115. ISBN 978-0755200641. 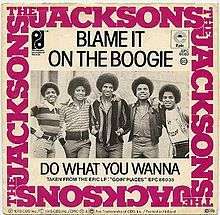 ↑ "Ultratop.be – The Jacksons – Blame It On The Boogie" (in Dutch). Ultratop 50. 1 2 "Blame it on the boogie in Irish Chart". IRMA. Archived from the original on 5 January 2010. Retrieved 8 July 2013. Only results when searching "Blame it on the boogie"
↑ "Nederlandse Top 40 – The Jacksons search results" (in Dutch) Dutch Top 40. 1 2 "Dutchcharts.nl – The Jacksons – Blame It On The Boogie" (in Dutch). Single Top 100. ↑ "Charts.org.nz – The Jacksons – Blame It On The Boogie". Top 40 Singles. ↑ Danyel Smith, ed. (1979). Billboard 23 june 1979. Nielsen Business Media, Inc. ISSN 0006-2510. Retrieved 8 July 2013. 1 2 "Jackson 5: Artist Chart History" Official Charts Company. 1 2 3 "Destiny awards on Allmusic". Allmusic. Retrieved 8 July 2013. ↑ "Australian-charts.com – The Jacksons – Blame It On The Boogie". ARIA Top 50 Singles. ↑ "Top 100 1978 - UK Music Charts". Uk-charts.top-source.info. Retrieved 2016-10-13. ↑ "1978 Year End". Bullfrogspond.com. Retrieved 2016-10-13. ↑ "Top Selling Singles of 1979 | The Official New Zealand Music Chart". Nztop40.co.nz. 1979-12-31. Retrieved 2016-10-13. ↑ "Australian-charts.com – Big Fun – Blame It On The Boogie". ARIA Top 50 Singles. ↑ "Ultratop.be – Big Fun – Blame It On The Boogie" (in Dutch). Ultratop 50. ↑ "Lescharts.com – Big Fun – Blame It On The Boogie" (in French). Les classement single. ↑ "Offiziellecharts.de – Big Fun – Blame It On The Boogie". GfK Entertainment Charts. ↑ "Nederlandse Top 40 – Big Fun search results" (in Dutch) Dutch Top 40. ↑ "Dutchcharts.nl – Big Fun – Blame It On The Boogie" (in Dutch). Single Top 100. ↑ "Charts.org.nz – Big Fun – Blame It On The Boogie". Top 40 Singles. ↑ "Archive Chart: 1989-09-09" UK Singles Chart. ↑ "Top 100 1989 - UK Music Charts". Uk-charts.top-source.info. Retrieved 2016-10-13. ↑ "El Hit Parade De Vilo". El Siglo de Torreón (in Spanish). ↑ "Channel 4 documentary site". Channel4.com. Retrieved 2010-06-13. ↑ "iTunes link for Mick's album "Weekend"". itunes.apple.com. Retrieved 2010-06-13. ↑ Mick Jackson & Sam Peter Jackson - Blame it on the Boogie Interview. Vimeo. "Yo Que No Vivo Sin Ti"
"Tengo Todo Excepto a Ti"